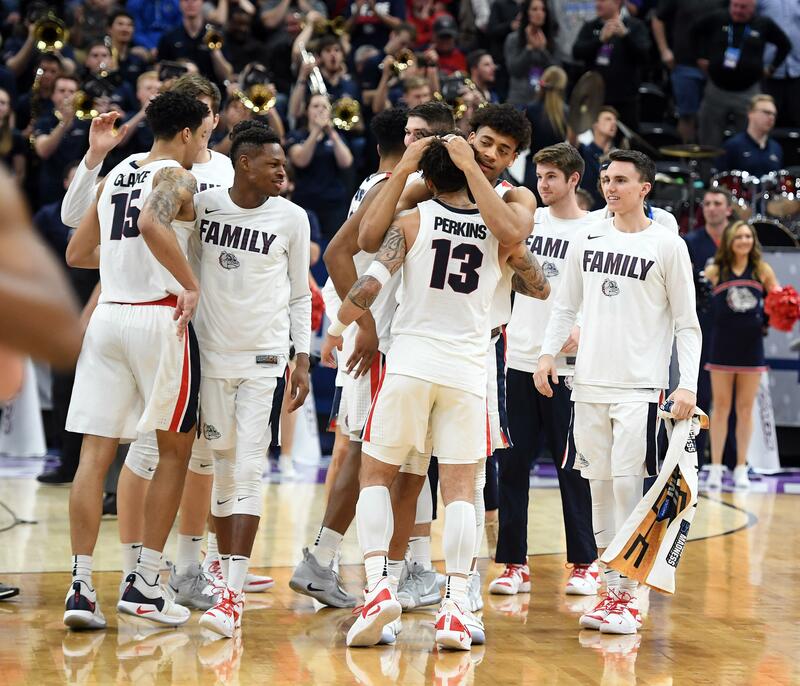 UPDATED: Sun., March 24, 2019, 11:28 p.m.
Time for a civil, measured examination of Gonzaga and this latest milestone of reaching the NCAA Sweet 16 five years running. There’s that trigger – no national championship. Chew on that, pit bulls. Now that we’re outside the city limits of One Issueville, let’s talk Sweet 16. It is not the Zags’ end goal, by any means. Never really has been since Gonzaga basketball stopped just aspiring for relevance and evolved into a phenomenon. But it is still very much an achievement. With the first weekend of the tournament now over, fewer than 5 percent of college basketball’s 353 teams are still playing. Kansas and Kansas State, both No. 4 seeds this year, aren’t. Virginia, a No. 1 seed last March, didn’t make it past the first Friday last year. It’s hard to win two games, regardless of the seed number. And the Bulldogs, with their victories in Salt Lake City over Fairleigh Dickinson and Baylor this past weekend, have done it five years in a row. The Zags own the longest active Sweet 16 streak in the country. The closest comparable runs – three in a row – belong to Kentucky, Michigan and Purdue. You can figure out the programs outside that brief list. Moreover, there are only 11 other streaks in tournament history as long or longer, though all but three come with asterisks, falling as they do before the bracket reached 64 teams. Two other five-year runs – Kentucky and St. Joseph’s – started in the 1950s, when the field was never bigger than 25. So neither had to win a game, which made it more of a Shrug 16. Same holds true for another Kentucky six-year streak and one by Cincinnati in the ’60s. When Notre Dame reached the round of 16 six times in a row in the ’70s, the bracket was 32 teams, requiring just a single win. Only the long runs by North Carolina (13 years) and Duke (separate streaks of nine and seven) occurred after full expansion and can be considered meaningful. Even UCLA’s record 14 straight included eight years of byes into the Sweet 16. Though let’s be real – nine consecutive national championships suggest that the Bruins would have done just fine against any and all opponents. Just as interesting: Only that Duke run of nine Sweet 16s has occurred in the past 20 years. It’s simply more difficult than ever to put together back-to-back wins in the NCAA Tournament. The talent gap narrows; rosters of one-and-done kids get one-and-undone by those with grizzled upperclassmen. “In this kind of a tournament, even the little guys are coming after you because they believe they can do it,” said Kispert. Little guys – 14th-seeded Bucknell in 2005 and No. 15 Middle Tennessee in 2015 – ended runs by Kansas and Michigan State after four straight years. Four other programs in the 2000s – Florida, Louisville, Memphis and Wisconsin – saw their drives for five end when they didn’t even make the field. Ah, but the many critics argue, as a high seed, the Zags should advance at least through the first weekend. Heck, yes. And every year, too – just like every other high seed. And yet it’s Gonzaga with the numbing consistency. Why do you suppose that is? By the way, the Zags have been a No. 1 seed twice these past five years, a No. 2, a 4 – and an 11. In their respective streaks, Duke has never been lower than a No. 5. North Carolina was a No. 8 once. That’s it. Well, it does unless the theory holder simply doesn’t want it to. That’s about the only way to resist a pretty Sweet argument. Published: March 24, 2019, 7:27 p.m. Updated: March 24, 2019, 11:28 p.m.